This review has been a long time coming. I have read a number of other books by the Australian 'Queen of Fantasy' but have never expressed my public view on some of the other titles that I have read. 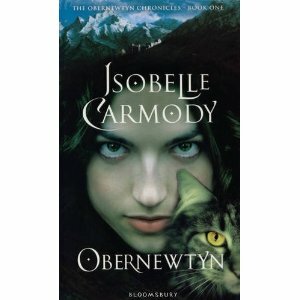 However, I am now going to put that right with this review, for Obernewtyn. It's really hard to believe that it has taken this long to be published in the U.K. This is the first book in the series and has been kicking around the fantasy world since 1987, after selling over 270,000 copies in Australia and gaining a huge fan base in the U.S. Finally, this best selling series is going to be published in the U.K for the first time in June, by Bloomsbury. Further books are due to be published in the next year or so including book two, The Farseekers, which should be available in August. I expected this book to be set within an over-the-top fantasy world and comprise of a lot of Sci-Fi terminology. However this did not happen, and as a result, this story actually felt a little more original and stood out due to the post apocalyptic world which has been used. This still pulls the reader towards the Sci-Fi world but the way in which Isobelle has adapted it, enables her to make the storyline her own. Carmody has a great way of portraying emotions which are developed and shown through the many different characters. They connect with the reader in so many ways and on so many different levels. The writing cleverly draws the reader into the intriguing and mysterious world. From start to end Isobelle creates an underlying feeling of oppressiveness, which compels the reader to endure it until the end, when the story finally comes to a halt. In a world struggling back from the brink of apocalypse, life is harsh. But for Elspeth Gordie, born with enhanced mental abilities, it is also dangerous. Survival is only by secrecy and so she determines never to use her forbidden powers. But it is as if they have their own imperative and she is brought to the attention of the totalitarian Council that rules the Land. Banished to the remote mountain institution of Obernewtyn, she must throw off her cloak of concealment and pit herself against those that would resurrect the terrible forces of the apocalypse. Only then will she learn most truly who and what she is ...Elspeth is determined to uncover the plot and so, accompanied only by her cat, Maruman, embarks on a terrible adventure full of danger, the conclusion to which promises not just uncertainty about her safety but also that of many around her. With many more books to come . . . . us lucky people in the UK have a great new series of books to enjoy. For me, this book is for readers who want more from a book, and also for the casual reader who has a limited amount of time. I am really looking forward to the next book in the series - in fact I have already ordered a U.S copy. Once gripped, I am the type of person who can't wait too long for the next book! This series is so fabulous. I read it all night long as a kid, staying up until the last page was turned. A brilliant, brilliant book.